Small items are organized together in moisture resistant, resealable bags. Cases can be wall mounted with the lid serving as a preparation tray. A contents list assists in restocking supplies. Kit is designed to provide complete first aid protection in a wide variety of workplace situations and will serve up to 25 people. 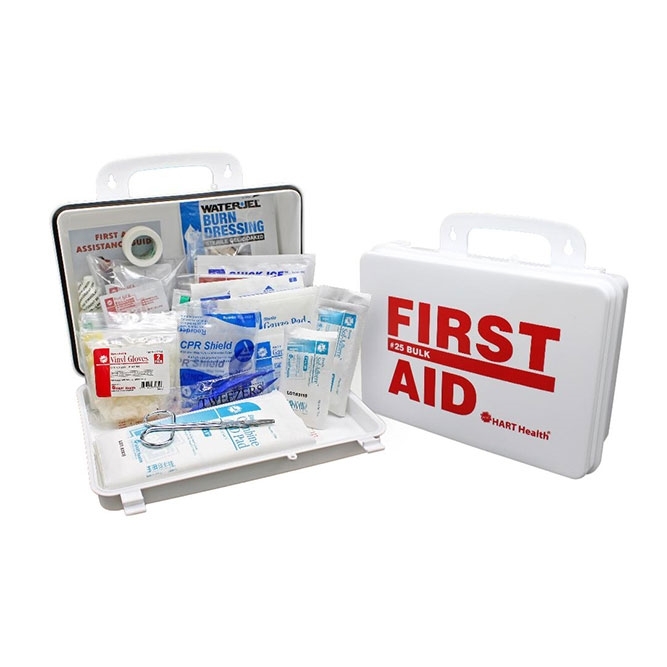 Housed in a rugged plastic case with wall hanging brackets and a carrying handle for long lasting service. Plastic Box Size: 10" x 7" x 3"
2 Abdominal Pads, sterile, 5" x 9"
4 Adhesive Bandages, 3/4" x 3"
16 Adhesive Bandages, 1" x 3"
1 Adhesive Bandage, 2" x 4"
2 Gauze Pads, sterile, 2" x 2"
4 Gauze Pads, sterile, 3" x 3"
1 Gauze Roll, stretch, sterile, 3" x 4.1 yds.